For two decades, a local nonprofit group has connected Estacada with a variety of arts experiences. 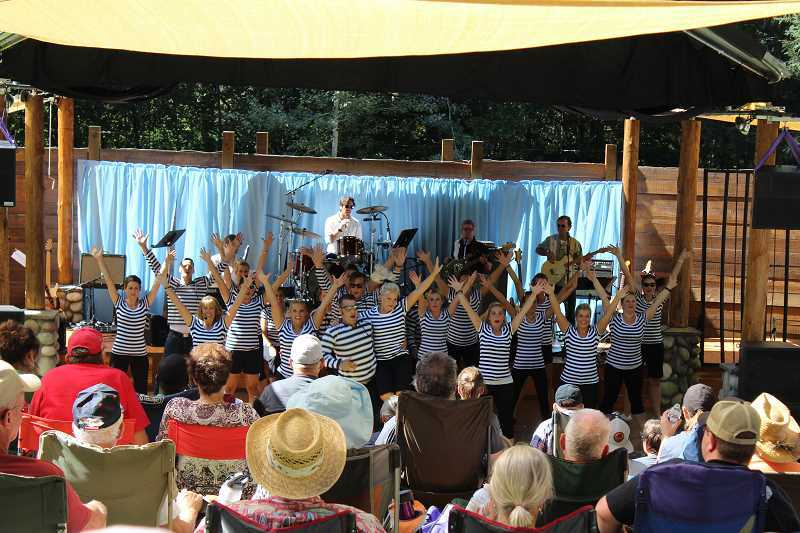 Estacada Together has sponsored many performances in town over the years, including the Oregon Symphony, the Oregon Shakespeare Festival, the Casimir Effect, the Army Band and the Vagabond Opera. They have also connected visiting artists with local schools. As a fundraiser for future Estacada Together events, the Aspen Meadow Band will play rock, soul, funk, blues and Motown numbers beginning at 7 p.m. Saturday, May 5, at the Estacada Auditorium, 500 N.E. Main St. Though concert is free, all donations will support Estacada Together. Jane Reid and Mary Ann Bugni, who serve on the group's board of directors, are particularly excited about the artist residencies at local schools that Estacada Together facilitates. "Our emphasis is morphing toward arts education and experiences for students," Reid said. "We're really proud of the in-depth experiences and longtime residencies at the schools." This year, the group has connected Reeva Wortel with art students at Estacada High School and Ellen Whyte with students at Estacada Middle School. Wortel, a visual artist, is working with high school art teacher Janice Packard to facilitate students in a portrait and interview project. Students have been interviewing community members and then painting or drawing portraits of them. The theme of the project is life in a small town, and the completed portraits, along with quotes from the interviews, will be on display at Estacada City Hall beginning Thursday, April 19. There will be an opening reception for the show from 6-7 p.m., April 19, at City Hall, 475 S.E. Main St. Meanwhile, at Estacada Middle School, seventh grade students have been working with Whye to create original songs as they learn about cultures in Africa in a project titled "Rites of Passage." Students, along with Whyte and fellow musician JP Garau, will perform the songs at 7 p.m. Friday, April 13, at the Estacada Auditorium. Bugni appreciates being able to connect students with one-of-a-kind learning opportunities through these residencies. "(Students) learn their practical curriculum through art. It's learning in a different way," she said. "(It's great seeing) the happy faces of children involved with arts in education. It's a unique way to learn about social studies or science." Reflecting on the performances Estacada Together has brought to town over the years, both Reid and Bugni cite the Oregon Symphony's visits as some of the most exciting. Through the symphony's Community Music Partnership grant, local schools received workshops from symphony members, and the musical group performed several concerts for the community. "The Oregon Symphony fell in love with Estacada, and we fell in love with them," Bugni said. "Enthusiasm for the symphony was high." During the symphony's Christmas concerts in Estacada, she noted, "the auditorium was filled to the brim." Reid and Bugni encouraged anyone interested working with Estacada Together to contact them through www.estacadatogether.org. "We love working with our board," Reid said, noting that the time commitment is between two to five hours per month. After a productive 20 years, Estacada Together leaders are eager to maintain their work in town. "We want to continue to bring outstanding performances to Estacada," Bugni said, adding that the group also appreciates variety of the arts elements they facilitate. "We want to try it all."